If you want to charter a luxury skippered yacht, RiB or Powerboat on the South Coast between the Solent and Weymouth then look no further. We have a very experienced and dedicated team that can organise a truly exciting and luxurious weekend or week for you to remember. Dinner - on shore at selected restaurants. Chauffeur driven transfers from Railway Stations or Airport. Accommodation - Luxury hotel accommodation at the end of your trip. Please contact us and we will organise everything. If you would like more excitement why don’t you charter one of our boats and join in one of the many yachts races in the Solent. 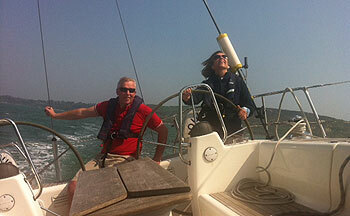 Our boats all include an experienced racing skipper and so you can enjoy yourself knowing that you are in safe hands. We cater for both private parties and corporate guests. Please contact us for details.